Want to feel like a royal superstar without making your wallet cry? The Royal Guest Rooms at Disney’s Port Orleans Riverside (The sister hotel to this month’s Best Of WDW Hotel – the Port Orleans French Quarter) have the upscale look and feel of a deluxe resort, yet come with a moderate resort price tag. Although there might be some challenges to these rooms to take into consideration, overall they are beautifully designed and quite impressive. A Royal Welcome. Photo by WDW Shutterbug. Disney’s Port Orleans Riverside is a moderate resort located in the Downtown Disney area. Rooms in the Magnolia Bend buildings (Oak Manor and Parterre Place) were magically transformed into Royal Guest Rooms in 2012. Sticking with the Port Orleans (and New Orleans) theming, Princess Tiana, from The Princess and the Frog, is prominent in the décor of the rooms. 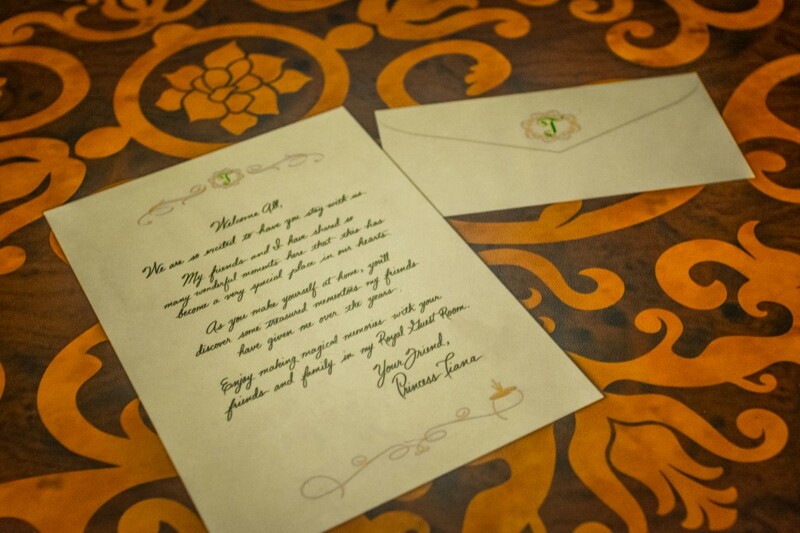 There is even a letter on the table in your room from Tiana welcoming your stay. Each Royal Guest Room has two queen size beds. Unfortunately when it comes to bedding for these rooms, queen is the only option. 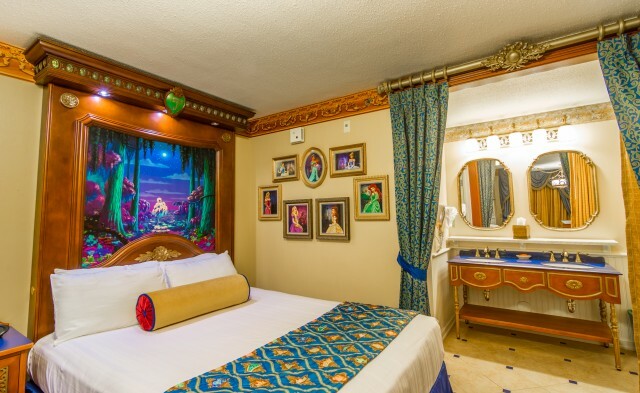 If you are looking for a king size bed or trundle, you will have to forgo the “royalty.” Imagineers have worked their magic in subtle ways throughout the room. The carpet will probably remind you of something you have seen in a movie somewhere, perhaps flying over Agrabah. The small luggage bench closely resembles the footstool “Sultan” from Beauty and the Beast, without all the jumping and barking. Royal Rooms at the Port Orleans Riverside are something special. Photo by WDW Shutterbug. The royalty of the room is evident from the carpet and drapes to the bed coverings and overall décor. Wood themes throughout add to the elegance, as well as the gold accents that adorn everything from the fabrics to the fixtures. The headboards, which extend all the way to the ceiling, feature magical pictures, which create a fiber optics “fireworks” display. The ornate dresser contains three small drawers for storage as well as a mini refrigerator. Additional space to hang clothes is located near the bathroom. Above the dresser is a wall mounted flat screen TV. 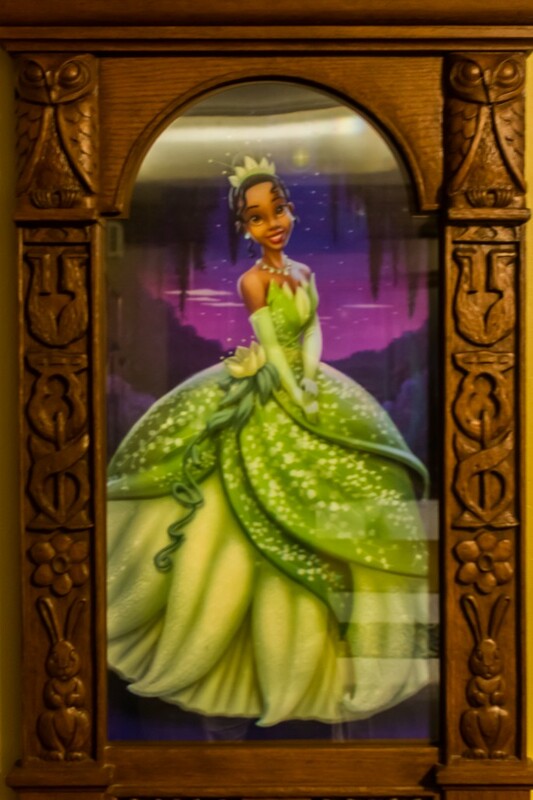 Decorations throughout the room include photographs of the Disney Princesses, including a more prominent picture of Princess Tiana. There is also a royal coat of arms featuring silhouettes of the Disney Princes. The Royal Guest Rooms are more majestic than princess-y, so boys will feel just as regal and not out of sorts. Royal details galore! Photo by WDW Shutterbug. The room, like most Walt Disney World resorts, contains a small table and chairs, however in the Royal Guest Rooms, they are fit for a prince or princess. No detail is spared, even the wall hooks look fancy. The bathroom faucet, which is shaped like an oil lamp, may give you the urge to make three wishes every time you wash your hands. There are four different types of Royal Guest Rooms to choose from; Standard View, River View, Garden View, and Pool View. Standard rooms have views of landscaping, the courtyard, or bayou, river rooms have views of the riverfront, garden rooms have views of the lush garden, and pool rooms have views of the courtyard pool. Amenities include a hair dryer, in room safe, coffee maker, iron and ironing board, Internet- free WiFi service, and telephone with voice mail. There are a few things worth considering if you are thinking about booking a Royal Guest Room. The Magnolia Bend buildings are furthest from the main building, bus stop, and main pool. If you like peace and quiet and don’t mind a small walk, you will be fine. However if you are looking for convenience and don’t want to have a long hike after being in the parks all day, you may want to forego these rooms. Tiana oversees every little detail! Photo by WDW Shutterbug. Compared to the other standard rooms at Port Orleans Riverside, the Royal Guest Rooms will cost you about $40 more per night (give or take, depending on the time of year and yearly rate increases). The royal rooms, which are approximately 314 square feet and sleep up to four adults, are on par in size with other moderate rooms that feature queen size beds. 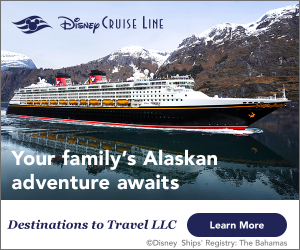 On the other hand, deluxe rooms that portray the same amount of elegance (think Disney’s Grand Floridian Resort and Spa) will set you back around $250 more a night for an increase of 126 square feet of space. If you are looking for a room that feels deluxe without the expensive price tag and don’t mind being a little far away from the main building, then you definitely want to consider the Royal Guest Rooms at Disney’s Port Orleans Resort. 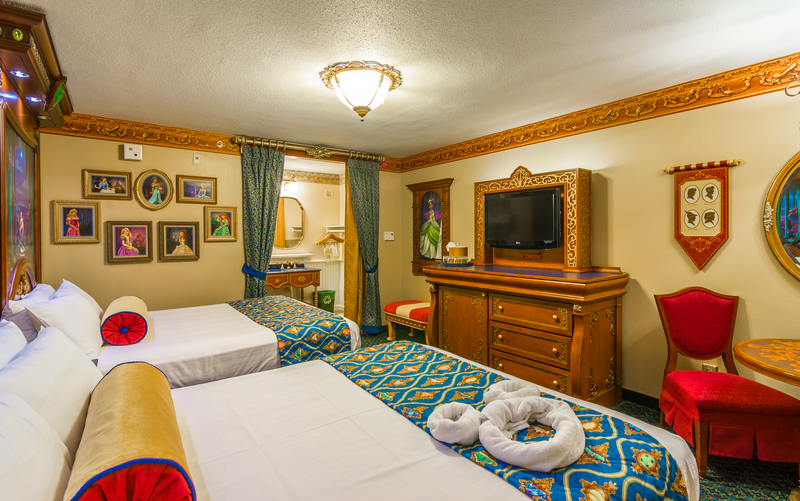 Have you stayed in the Royal Guest Rooms before? Let us know what you think!